Cat groomer Cassie McGlone tails a killer gone wild over feral felines. . .
Cassie’s good friend Dawn is part of an organization that’s trying to protect a colony of stray cats on the property of a senior condo community in Chadwick, New Jersey. The residents have got their backs up over the cat invasion, and Dawn has come to Cassie’s grooming and boarding shop, Cassie’s Comfy Cats, to ask her help in talking sense to them. Not everyone’s against the cats. Eccentric Sabrina Ward feeds them and has even created makeshift shelters for them in the nearby woods, infuriating her neighbors. Following a heated community meeting–in which Cassie and her veterinarian boyfriend come up with a proposal–Sabrina’s body is found in the woods. The police are calling her death an accident, but Cassie smells a rat. Narrowing down the list of suspects may be tougher than herding cats, but Cassie is determined to collar the killer before another cat lover has a fatal accident . 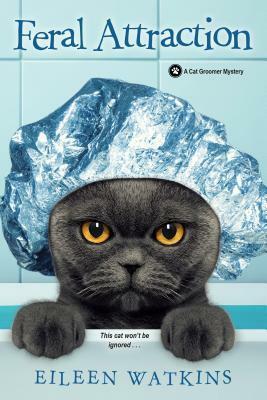 . .
Feral Attraction by Eileen Watkins is an exciting feline mystery. It turns out that a community of feral cats have moved closer to an older retired community housing center. That’s where all the trouble begins…A few residents began feeding the cats thus, an increase in the population of feral cats being seen. Many of the residents do not like the cats and want them gone. Some are willing to go to the extreme to get rid of the cats and those invloved in helping the cats stay alive and free. Murder, mayhem, and a charming cast of characters are found in this book. I love how an expert cat groomer who has an animal behavior degree is called in to settle the dispute. But Cassie soon finds herself in more hot trouble than she can handle…I loved reading this new novel. Overall, I would recommend Feral Attraction to all readers. I can’t wait for the next book!